Have you joined yet? It’s easy! Simply email temple@iskcondurban.net with #TeamLove in the subject line and we will contact you. Or you can WhatsApp #TeamLove to 062 526 3606. #TeamLove kicks off with the temple maha clean-up on Sunday 19 August. Bhakti Yoga Society (BYS) Needs A Cover! His Holiness Bhaktijivana Vrajananda Swami’s visit to Durban has been delayed. Sri Caitanya Mahaprabhu set the example on how to welcome the Lord by personally cleansing the Gundica Temple. In preparation of Sri Krishna Janmashtami and following in the Lord’s footsteps we will be doing a thorough cleansing of Sri Sri Radha Radhanath Temple, the temple gardens, and including the surrounding area. You are invited to join in and help make the temple more beautiful for the Lord’s divine appearance. 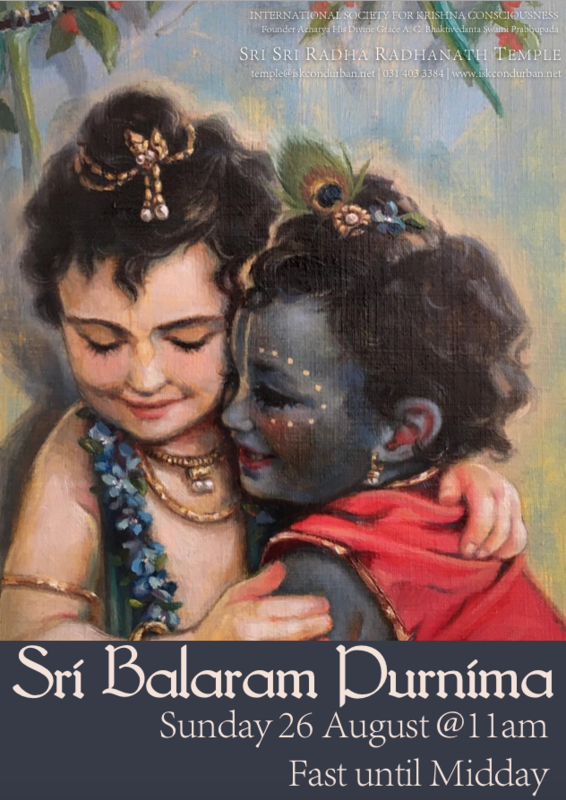 Chota Sri Sri Radha Radhanath swing festival will begin after Gaura-arati.